The decoy effect is a cognitive bias that means people can be persuaded to change their preference between two choices when a third (decoy) option is introduced. The decoy has to be clearly inferior in all respects to one of the offers and inferior in some respects to the other option to make them look more attractive. In the example below the introduction of the middle plan (Print only subscription) draws attention away from the digital only plan. It persuades more users to choose the more expensive plan because the decoy (print only) makes the digital + print subscription look more appealing and the digital only plan appears to be a foolish option. Below is an example of decoy offer from The Financial Times. Notice the “Print Trial” offer is priced the same as the “Print and Digital” package so there is no real benefit in the former plan. 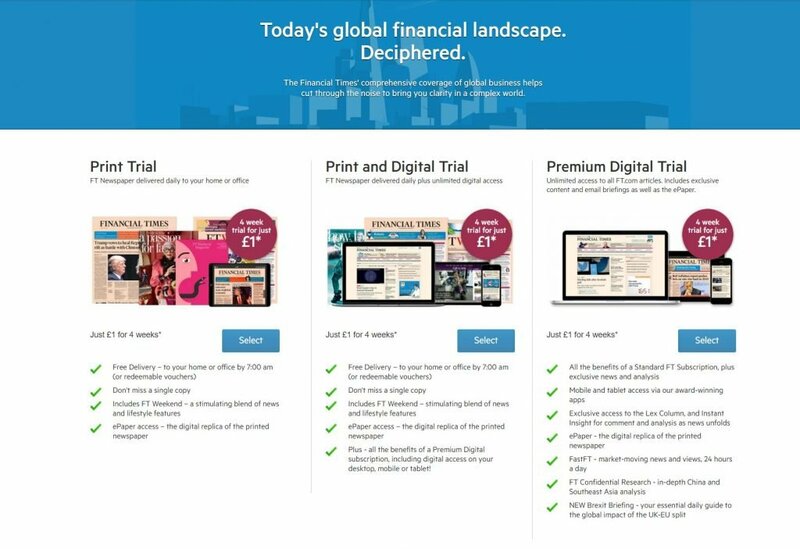 As all choices are relative, the “Print Trial” helps make the other two plans appear more attractive and should encourage more people to subscribe to the the “Premium Digital Trial” plan.